Nepal’s devastating earthquake last Saturday was both tragic and expected. On September 18, 2011, as colleagues and I were driving through Kathmandu, our car started to shake, buildings began to sway, store fronts cracked, hundreds of people jumped out of windows and streamed into already crowded streets. It was the so-called Sikkim earthquake. There were only a few fatalities and injuries – it was a very minor event compared to last weekend’s disaster. But it validated the rationale for our visit: to help launch a disaster relief dialogue involving U.S. government experts, Nepalese security forces, and their country’s emergency responders. We also imagined, sadly, it was a harbinger of things to come. Sitting atop colliding tectonic plates, the Nepalese people inhabit one of our planet’s most earthquake-prone regions. The urban sprawl of their historic capital city, Kathmandu, swells across a high mountain valley around which seismic shocks (and aftershocks) can bounce and reverberate. When these plates shifted on Saturday, the Indian subcontinent driving underneath Eurasia, more than 8 million people were eventually affected. Estimated fatalities currently exceed 5,000 and are still rising, with thousands more injured and remote areas closer to the quake’s epicenter still largely cutoff. Is there any good news here? Well, tragically, a sense of inevitability does hone a degree of personal resilience and public preparedness. Disaster risk reduction has been a highly visible theme in Nepal’s international partnerships over the past decade, despite the country’s political fragility and severe economic hardships, and we may be seeing glimpses of that right now. While many poorly constructed buildings collapsed, others that had been reinforced appear to have survived. Fatalities and injuries overall appear be far less than what Haiti endured five years ago, when an earthquake of lesser magnitude devastated Port-au-Prince’s large urban area, killing more than 200,000 and injuring over 300,000 more. So what challenges will the Nepalese people and emergency relief workers face in the coming days? I’d flag three grueling realities. The task of opening up and managing key relief routes is going to be a huge hurdle. Kathmandu’s Tribhuvan international airport survived largely intact – that’s a great plus. But it has only one runway and limited tarmac space, not nearly large enough to accommodate a huge in-flux of cargo aircraft loaded with aid supplies and requesting clearance to land. Overstressed air-traffic controllers will need continuous advice from relief experts on how best to allocate their scarce landing slots across a wide range of key relief sectors – food, water, shelter, medical services, engineering, etc. A straightforward “first come/first serve” approach for clearing flights just won’t work. Meanwhile, overland routes are highly congested as survivors head out and aid convoys head in. Staging areas with helicopter lifts for humanitarian supplies, which have already started, may help offset this to a degree. Second, there’s the massive displacement challenge. Vast numbers of people have fled their damaged or destroyed homes. Makeshift shelters are popping up everywhere. The Nepalese government and its international partners are designating open spaces across the Kathmandu Valley as sites for temporary encampments, and shelter supplies are being given a high priority, as they should be. Still, the hurdles here are going to be acute. Will security forces be able to prevent night-time robberies and sexual assaults? Will there be enough open space for these camps, given the Kathmandu Valley’s already high population density? Will Nepalese security forces have sufficient capabilities to generate a calming presence in and around these camps? Might international peacekeepers be needed? Regardless of who patrols these camps, will they be able to prevent night-time robberies and sexual assaults, which can plague displaced persons camps? In this regard, solar lighting in public spaces will be absolutely vital. 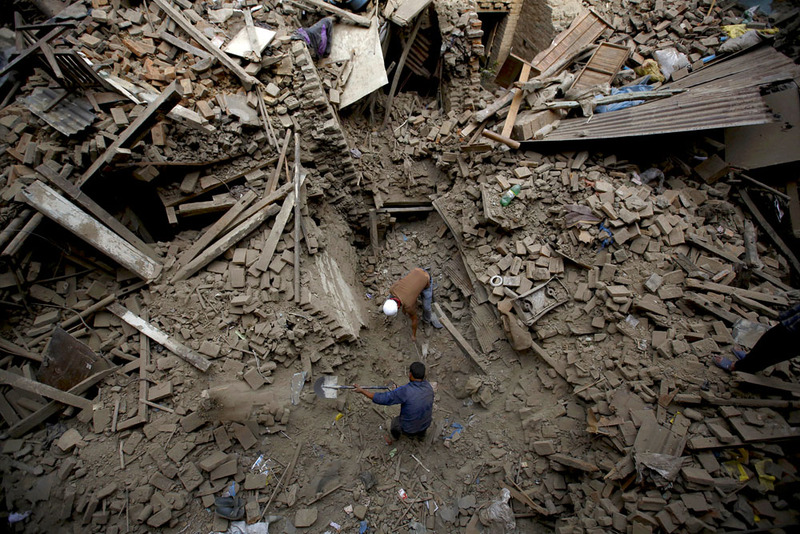 And how soon can Nepalese authorities ramp up habitability assessments, rubble removal, and housing repairs? People are rightly fearful of returning to damaged or fragile dwellings, and the country could be facing months, possibly years of extended displacement if the process drags out. Third, there’s a “hybrid-hazard” challenge. Seismic aftershocks still abound, and monsoon season is not far away (rains have already started). These two factors aid and abet the likelihood of further landslides, blocked roads, flash flooding, and damage to water, sewage, and public works infrastructure on a large scale. There’s no easy way to mitigate these hazards, especially for large displaced populations living under tents where heavy rains and high winds can wreak havoc. To every extent possible, flooding and landside risk mitigation, along with rubble removal from roads and drainage systems, must be factored into the planning, construction, and management of these camps. Looking forward, the Nepalese people are well aware of the hazards they face. The wrenching photos of people pulling their neighbors out from under mounds of rubble shows the courage and resilience that inspires so many aid workers to do everything they can to provide life-saving relief and help move the recovery process forward. The overarching imperative here is to support Nepal’s efforts towards a full recovery and mitigate enduring seismic risks. This will be a steep uphill climb, quite literally. There are no quick fixes. James A. Schear is a public policy scholar at the Wilson Center. He previously oversaw the U.S. Department of Defense’s support for international disaster relief missions as deputy assistant secretary of defense for partnership strategy and stability operations from 2009 to 2013. Sources: BBC, CNN, Time, U.S. Geological Survey. Photo Credit: People search for family members trapped inside collapsed houses in Kathmandu on April 26, courtesy of Navesh Chitrakar/Reuters. Immediate relief work is important, but so is reconstruction in the aftermath.